(Nanowerk News) Scientists have shown that gold nanotubes have many applications in fighting cancer: internal nanoprobes for high-resolution imaging; drug delivery vehicles; and agents for destroying cancer cells. The study, published today in the journal Advanced Functional Materials ("Engineering Gold Nanotubes with Controlled Length and Near-Infrared Absorption for Theranostic Applications"), details the first successful demonstration of the biomedical use of gold nanotubes in a mouse model of human cancer. Study lead author Dr Sunjie Ye, who is based in both the School of Physics and Astronomy and the Leeds Institute for Biomedical and Clinical Sciences at the University of Leeds, said: "High recurrence rates of tumours after surgical removal remain a formidable challenge in cancer therapy. Chemo- or radiotherapy is often given following surgery to prevent this, but these treatments cause serious side effects. Gold nanotubes - that is, gold nanoparticles with tubular structures that resemble tiny drinking straws - have the potential to enhance the efficacy of these conventional treatments by integrating diagnosis and therapy in one single system." The researchers say that a new technique to control the length of nanotubes underpins the research. By controlling the length, the researchers were able to produce gold nanotubes with the right dimensions to absorb a type of light called 'near infrared'. The study's corresponding author Professor Steve Evans, from the School of Physics and Astronomy at the University of Leeds, said: "Human tissue is transparent for certain frequencies of light - in the red/infrared region. This is why parts of your hand appear red when a torch is shone through it. "When the gold nanotubes travel through the body, if light of the right frequency is shone on them they absorb the light. This light energy is converted to heat, rather like the warmth generated by the Sun on skin. 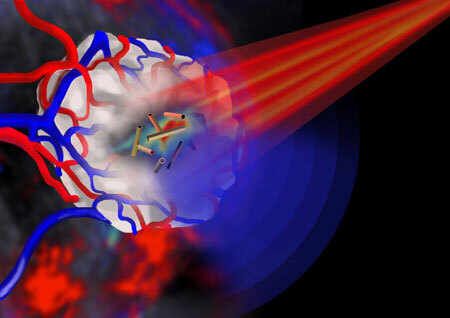 Using a pulsed laser beam, we were able to rapidly raise the temperature in the vicinity of the nanotubes so that it was high enough to destroy cancer cells." In order to see the gold nanotubes in the body, the researchers used a new type of imaging technique called 'multispectral optoacoustic tomography' (MSOT) to detect the gold nanotubes in mice, in which gold nanotubes had been injected intravenously. It is the first biomedical application of gold nanotubes within a living organism. It was also shown that gold nanotubes were excreted from the body and therefore are unlikely to cause problems in terms of toxicity, an important consideration when developing nanoparticles for clinical use. Study co-author Dr James McLaughlan, from the School of Electronic & Electrical Engineering at the University of Leeds, said: "This is the first demonstration of the production, and use for imaging and cancer therapy, of gold nanotubes that strongly absorb light within the 'optical window' of biological tissue. "The nanotubes can be tumour-targeted and have a central 'hollow' core that can be loaded with a therapeutic payload. This combination of targeting and localised release of a therapeutic agent could, in this age of personalised medicine, be used to identify and treat cancer with minimal toxicity to patients."